Click on a question below to learn more about our products. Who certifies Kosmea's Rosehip Oil to be organic? 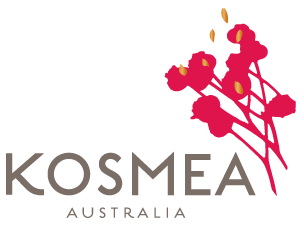 Kosmea Certified Organic Rosehip Oil is certified by the following governing bodies: BCS Europe, Australian Certified Organic (ACO), and Ecocert. Our oil is also certified Kosher and Halal. In which order do I apply the Kosmea product range? 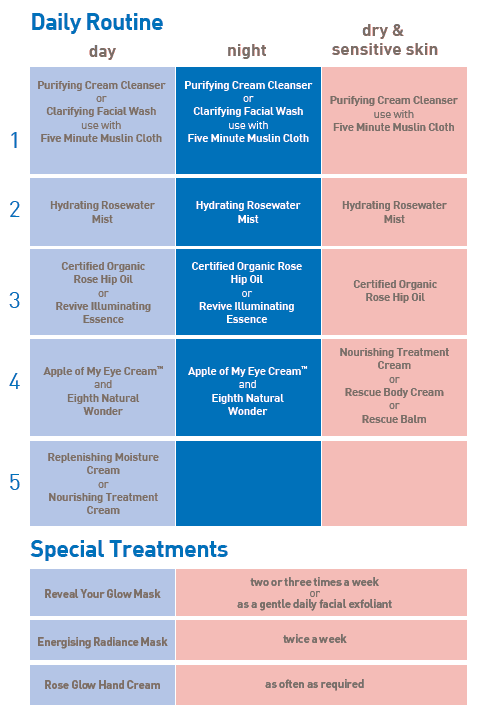 We recommend the following skincare routine with our range of natural products. What preservatives does Kosmea use? 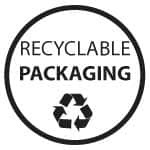 We couldn’t guarantee our the shelf life or stability of our products if we did not use preservatives, we believe in using preservatives at a level that makes the product safe to use and ensures that when you take it home it doesn’t go off. We typically use the lowest possible percentage of the mildest and safest preservatives to protect you and the longevity of our products. How long do Kosmea's products last? Our natural skin care range has a shelf life of 36 months from the date of manufacture if unopened. Once opened, products must be used within 6 months. Do Kosmea products contain animal ingredients? None of our products contain animal ingredients and are vegan friendly except for the Rescue Balm and Kiss from a Rose Lip Balm which contain beeswax. Are Kosmea products cruelty free? Yes our products are cruelty free. 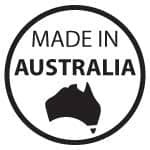 As we do not test any products, or product ingredients on animals Kosmea have accreditation as a Choose Cruelty Free Company and are PETA Cruelty-Free accredited. The Kosmea natural skin care range is free from artificial colours, artificial fragrances, mineral oils, petrochemicals, parabens, sodium lauryl sulphate and animal ingredients. Also, our products are not tested on animals. Can you use Kosmea products around the eye area? Yes, the Kosmea range is free from harmful chemicals and is safe to use around the delicate eye area. However, as with any skin care product, we recommend you avoid applying close to the eyes. My Certified Organic Rosehip Oil smells/looks different to the last one that I purchased, is there something wrong with it? At Kosmea we take great pride in sourcing the finest rose hip oil in the world, which comes from a certified organic source where no fertilisers or pesticides are used. Our oil has a natural earthy smell, as we use fruit, skin and the seed of the rose hip to extract our oil. It is the outer casing of the rose hip that is rich with the antioxidant lycopene, which gives our oil that beautiful, rich amber colour. To ensure we give our customers a rose hip oil rich in its natural vitamins, antioxidants and essential fatty acids, we have chosen to have minimal intervention in its production. Therefore, we do not bleach, colour, or deodorise our oil to make it more commercially attractive. As we choose not to intervene with nature it does mean that as a result of seasonal climate and crop changes, our organic rose hip oil may vary slightly in colour, aroma and texture. We guarantee you that the quality and performance of the product is unaffected and your rose hip oil is exactly as nature intended. What can I use on my baby to keep their skin hydrated? Kosmea Certified Organic Rosehip Oil can be used babies from birth to keep their skin nourished and healthy. Massaged into baby’s damp skin it is easily absorbed and non-greasy. As a natural source of essential fatty acids and vitamins it moisturises and replenishes the skin, helping to protect it from dryness and itchiness. Other products that can be used on babies include our Rescue Balm, Rescue Body Cream, Nourishing Treatment Cream, Muslin Cloth, and Hydrating Rosewater Mist. Your rosehip oil contains vitamin A, can I still use it during pregnancy? We recommend Kosmea Certified Organic Rosehip Oil during and after pregnancy, as it may help in maintaining skin elasticity, help to restore skin moisture and help to minimise the appearance of stretch marks. Kosmea Certified Organic Rosehip Oil is a fruit oil and can be used on both mother and baby at anytime. The vitamin A in our oil is naturally occurring, just as it is in the fruit and vegetables we eat every day, and is safe to use during pregnancy. Can I still use your Certified Organic Rosehip Oil, now that I use the Eighth Natural Wonder™? Are Kosmea products gluten free? All Kosmea products are gluten free. Do you make a product with SPF? Our Moisturising Lotion SPF 30 has been discontinued. At this time we do not make any products with SPF and there are no future plans to add such a product to the range. Does Kosmea's Reveal Your Glow Mask contain microbeads? No, this product does not and never has contained microbeads. We use natural ingredients as exfoliants such as crushed chamomile flowers and ground rosehips. Where are the Facial Cleansing Wipes? Unfortunately this product has been discontinued and we will no longer be stocking facial wipes. Why can't I find the Daily Facial Exfoliant? This product has been replaced by our Reveal Your Glow Mask. Same beautiful formula, better used as a mask! Applying the product for longer allows the ingredients to benefit your skin more. Do you still have a Rose Hand and Body Range? We have kept our Rose Glow Hand Cream but unfortunately all of the other rose range of products have been discontinued. Why can't I find the Radiance 24/7 Youth Boost? This product has been replaced by our Revive Illuminating Essence, a new and improved blend of antioxidant fruit oils!